Systemic Risk Hub is an independent and collaborative initiative, which groups together	leading researchers, academics and professionals, acting separately or altogether within various institutions around the world. The aim of this Hub is to bring together the most outstanding developments in the current	literature regarding systemic risk, creating a platform for transfers of knowledge and dialogue. This Hub also encourages collaborative cross-fertilizations, evaluations and propositions of improved methodologies for assessing this type of risk. Systemic risk generally refers to the risk of a disruption to the flow of financial services that is (i) caused by an impairment of all or parts of the financial system and (ii) has the potential to have serious negative consequences on the real economy. Systemic risk arises when the failure of a single entity or cluster of entities can cause a cascading failure, due to the size and the interconnectedness of institutions, which could potentially bankrupt or bring down the entire financial system. In the video below, Dr. Jón Daníelsson and Dr. Jean-Pierre Zigrand (co-directors of the Systemic Risk Center at the London School of Economics) explain and illustrate what is systemic risk with a pedagogical analogy, which is based on the instability of the Millennium bridge in London due to homogeneous behaviors of pedestrians. Source: Systemic Risk Center. 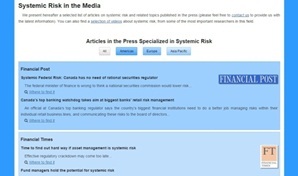 For more information and videos about Systemic Risk please check the new SRC Video Channel. Please click here to see our video section. Why Does Systemic Risk Matter? The recent Global Financial Crisis has clearly demonstrated the need for the financial industry, policymakers and citizens to develop a better understanding of systemic risk. A great deal of work is underway, intended to shed light on a number of fundamental questions: What is systemic risk? Where does it originate and how does it manifest itself? How can it be measured? And what can the industry and policymakers do to minimize and contain it? Identifying “Systemically Important Financial Institutions” (SIFI) constitutes a major concern for both academics and regulators. While historically “systemic importance” has been associated with an institution's size through the “too-big-to-fail” issue, recent events suggest a more complex picture. The interconnectedness of an SIFI is also determined by its interbank market linkages, and its effects are amplified by high leverage. The Financial Stability Board (2011) thus defines SIFI as “financial institutions whose distress or disorderly failure, because of their size, complexity and systemic interconnectedness, would cause a significant disruption to the wider financial system and economic activity”. Consequently, regulators and policy makers have called for tighter supervision, extra capital requirements, and some liquidity buffers for SIFI (Financial Stability Board, 2011). Moreover, a Pigouvian tax calibrated on the systemic importance of institutions has also been proposed to address the externalities of these too-big-to-fail or too-interconnected-to-fail institutions. Indeed, while all firms share the benefits of financial stability, market mechanisms do not exist to enforce firms to internalize the full cost of threats to stability created by their own activity. Therefore, measuring the financial systemic importance of financial institutions is crucial in identifying the potentially destabilizing constituents of the global financial system. Several ways have been proposed in the recent literature, from – without being exhaustive: cascade network representations, early warning signals with or without private information, degrees of connectedness – to quantitative measures of extreme under-performances and their impacts… One path in the current literature, for instance, consists of defining some proper systemic	risk measures – such as the Delta Conditional Value-at-Risk (ΔCoVaR) of Adrian and Brunnermeier (2011), the Multi-Conditional-VaR (MCoVaR) by Cao (2012), the Marginal Expected Shortfall (MES) of Acharya et al. (2010) and Brownlees and Engle (2012), the Component Expected Shortfall (CES) of Banulescu and Dumitrescu (2012), and the Systemic RISK measure (SRISK) of Acharya et al. (2012) and Brownlees and Engle (2012). However, it has been also shown by some academics how fragile some of these systemic risk measures are, as they are subject to model errors and are significantly linked to extreme quantiles. Moreover, the systemic risk rankings of financial institutions depend highly upon the adopted measure. A fair and robust system should take into account the complexity of the overall problem. We hope our initiative will contribute to the adoption of appropriate measures and, finally, to a safer global financial system and a more robust global economy. This page presents a selected list of articles on systemic risk and related topics published in the press (please feel free to contact us to provide us with the latest information). You can also find a selection of videos about systemic risk, from some of the most important researchers in this field. 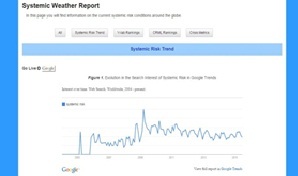 This page will provide you with important information on the current systemic risk conditions around the globe. 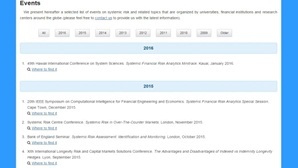 See the trends, rankings and the evolution of systemic risk. 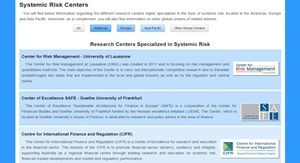 Here you will find information regarding the different research centers highly specialized in the topic of systemic risk, located in the Americas, Europe and Asia Pacific. 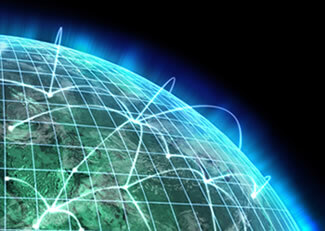 Moreover, as a complement, you will also find information on other global centers of related interest. We present hereafter a selected list of events on systemic risk and related topics that are organized by universities, financial institutions and research centers around the globe (please feel free to contact us to provide us with the latest information). 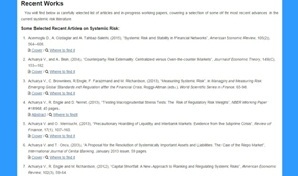 You will find in this page a carefully selected list of articles and in-progress working papers, covering a selection of some of the most recent advances in the current systemic risk literature. 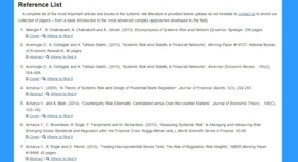 A complete list of the most important articles and books in the systemic risk literature is provided here (please do not hesitate to contact us to enrich our collection of papers – from a basic introduction to the most advanced complex approaches developed in the field). 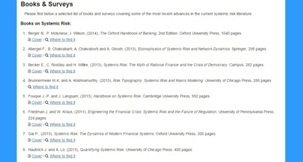 Please find in this page a selected list of books and surveys covering some of the most recent advances in the current systemic risk literature. 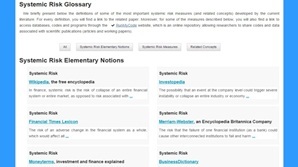 We briefly present the definitions of some of the most important systemic risk measures (and related concepts) developed by the current literature. For every definition, you will find a link to the related paper. 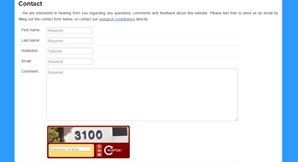 Moreover, for some of the measures described below, you will also find a link to access databases, codes and programs through the RunMyCode website, which is an online repository allowing researchers to share codes and data associated with scientific publications (articles and working papers). 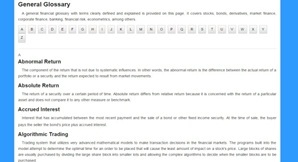 A general financial glossary with terms clearly defined and explained is provided on this page. It covers stocks, bonds, derivatives, market finance, corporate finance, banking, financial risk, econometrics, among others. 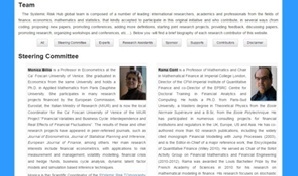 The Systemic Risk Hub global team is composed of a number of leading international researchers, academics and professionals from the fields of finance, economics, mathematics and statistics, that kindly accepted to participate in this original initiative and who contribute, in several ways (from coding, proposing new papers, promoting conferences, adding more definitions, starting joint research projects, providing feedback, discussing papers, promoting research, organizing workshops and conferences, etc…). Below you will find a brief biography of each research contributor of this website. 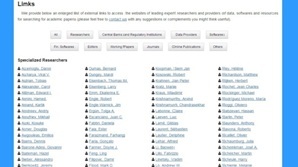 Here we provide an enlarged list of external links to access the websites of leading expert researchers and providers of data, softwares and resources for searching for academic papers (please feel free to contact us with any suggestions or complements you might think useful).